Gardiner Derek 5th December 2018 (peacefully) at hospital, late of Colinwood, Ballymena. Beloved husband of the late Esther. Funeral service in Henry’s Funeral Parlour, 100 Broughshane Street, Ballymena BT43 6EE on Friday 7th inst. at 11am interment afterwards Tullylish Parish Churchyard Banbridge (arriving 1.15pm approx). 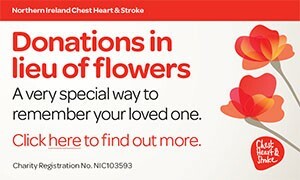 Family flowers only please, donations in lieu, if desired, may be sent to James Henry Funeral Services (address above) for Macmillan Cancer Care. Lovingly remembered by his sorrowing family circle. I am sorry to tell you that Derek Gardiner has passed away.